Funny Pregnancy Wishes: Being pregnant is not just about becoming a mommy-to-be. It is also about embracing irritating mood swings, bloating, bulging waistlines, weight gain, burping, food cravings and heaps of other quirks. 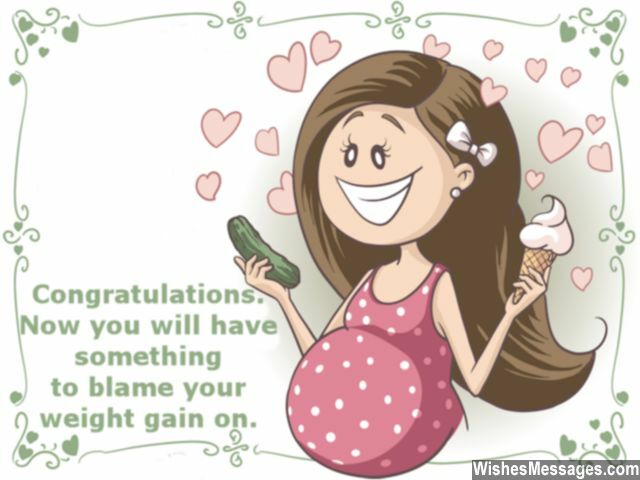 This post celebrates this cute yet annoying side of pregnancy with humorous quotes that are sure to make an expecting woman giggle away. Take ideas and write your own so you can share them on Pinterest, Facebook or by text. You can even jot your message down on a greeting card to make it your special way of saying congratulations. Your quirky wishes will infuse smiles and laughter into the beautiful nine month journey towards becoming parents. 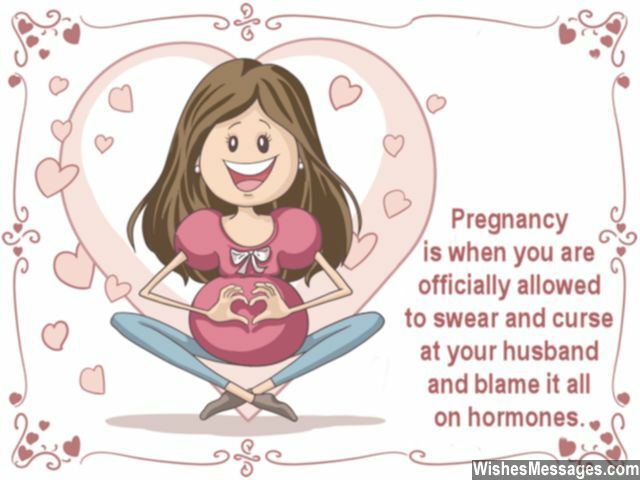 1) Pregnancy is when you are officially allowed to swear and curse at your husband and blame it all on hormones. Make the most of it. 2) You will gain weight, you will have mood swings, none of your clothes will fit and people will mistake you for being fat – welcome to the unglamorous world of pregnancy. 3) Welcome to the beginning of the end of your freedom for the rest of your life. Congratulations on your pregnancy. 4) Your pregnancy will be a celebration for your family, disaster for your career and a calamity for your husband. Good luck and congratulations. 5) Being pregnant means that you can put your feet up and watch TV while your husband does the dishes. Congratulations, enjoy every moment of it. 6) Nine months of pregnancy are God’s way of telling a woman that she can officially enslave her husband. Congratulations. 7) Congratulations for getting pregnant. Enjoy the luxury of getting your husband’s attention every time you make even a small sound – whether it is a painful moan or a smelly fart. 8) Pregnancy – the roller coaster ride which has no seat belts. Congratulations. 9) Be getting pregnant you have sacrificed parties, shopping sprees and weekend outings… for breast feeding, changing nappies and doing extra laundry. Congratulations. 10) Now that you are pregnant, can I borrow all your nice dresses? You won’t be able to fit in them anyways. Congratulations. 11) Pregnancy – the longest, fattest and the most irritating nine months of your life. Congratulations. 12) Everyone in the family is happy about your pregnancy except your husband because he isn’t going to get any for the next few months. Congratulations on your pregnancy. 13) PREGNANCY is actually spelled out as a phase which is Painful, Regretful, Excruciating, Ghastly, Nerve-wracking, Agonizing, Nightmarish, Chaotic and Yucky. Congratulations. 14) The two most important rules of becoming pregnant – cut down on fast food and give up drinking. How boring, congratulations. 15) You will go through a lot of changes in the coming nine months of your pregnancy. You will become crazier, weirder and creepier. Congratulations. 16) Congratulations. Now you will have something to blame your weight gain on. 17) Being pregnant is all about putting your feet up on the couch – so that your husband can massage them. Congratulations. 18) Pregnancy is the truly a blessing in disguise. Nine full months of nasty mood swings, backache and hormonal imbalance finally lead to the miraculous birth of a child. 19) Don’t expect any sympathy for your mood swings, morning sickness or backaches during your pregnancy… because you have invited all these troubles yourself. Congratulations. 20) Pregnancy – the nine months that will wipe off your savings and ruin your bank balance. Congratulations for taking the first step towards financial downfall. 21) Think about all the crazy things you wanted to do before you became a mother. Now keep dreaming because you will never be able to do them as you are already pregnant. Sorry, but congratulations. 22) Celebrity moms make parenting look glamorous because they are rich and can hire help for just about everything. You my dear… will be heating milk bottles and changing nappies day and night. Congratulations. 23) From being hooked up to getting knocked up – your journey has as a couple has come a long way. Congratulations for getting pregnant. 24) I never knew that a person who is still a baby by heart could also have a baby herself. Congratulations for your pregnancy. 25) Welcome to the golden period of life when you get to blame your husband for all the things that go wrong and take credit for all the things that are done right. Congratulations. 26) You have officially graduated from the Small to Plus sizes for clothes at all your favorite shopping malls. Congratulations on getting pregnant. 27) The best part about being pregnant is that you will never have nightmares… because you will not be able to sleep in the first place. Congratulations. 28) Most women do everything they can to have a flat tummy. But you did everything you could to have a large and round tummy. Congratulations. 29) Weight gain, pain, mood swings, discomfort and sleepless nights – which part of pregnancy are you looking forward to? 30) You can’t have the cake and eat it too. Maybe that’s why pregnancy is marred with crazy hormones. 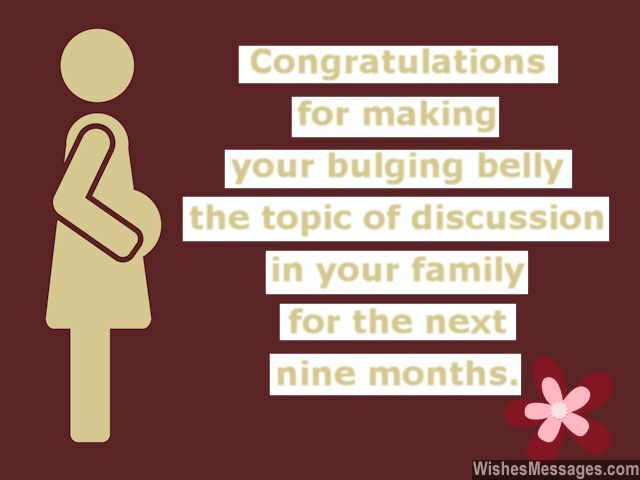 31) Congratulations for making your bulging belly the topic of discussion in your family for the next nine months. 32) Make the most of the nine months of your pregnancy. You can officially shout and scream at your husband without any reason. 33) Pregnancy is a journey of going through many INGs including nauseatING, sweatING, bloatING, burpING, itchING, swellING and fartING. Enjoy. 34) All your life you were told that pregnancy was supposed to be a beautiful journey. Now the bubble bursts. Good luck. 35) Being pregnant is possibly the only time when you are allowed to be moody, gloated, demanding, cranky and grumpy all at the same time… without anyone getting upset at you. Congratulations.